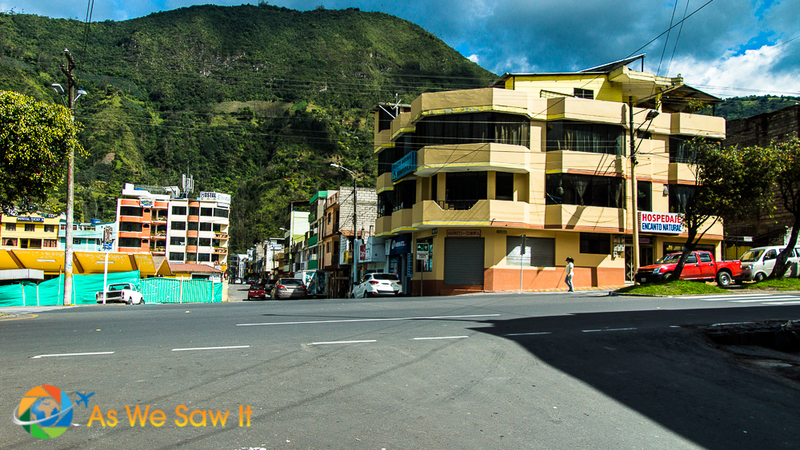 Baños, Ecuador may not appear to be anything special at first glance, but looks can be deceiving. 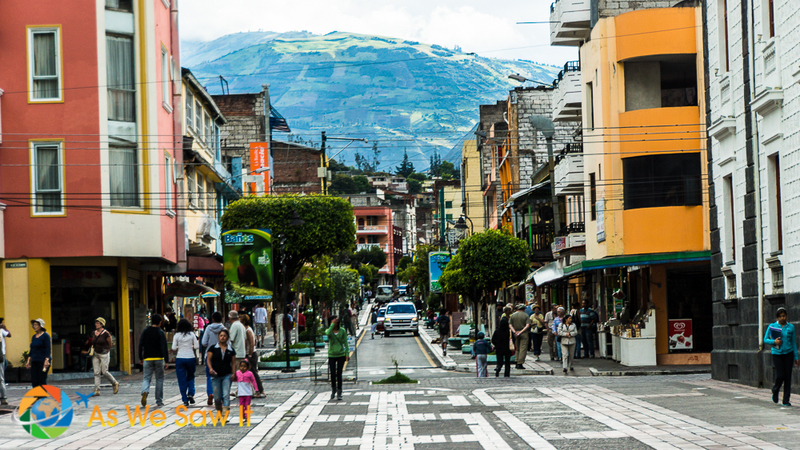 With all the great things you can do, this little tourist town is actually one of the most popular tourist attractions in Ecuador. Besides amazing natural beauty (countless more than 60 waterfalls), Baños offers everything from extreme sports and nature to miracle cures and thermal baths. It is also the “gateway to the Amazon,” a perfect spot to begin an exploration of Ecuador's Oriente region. If you're beginning to feel spoiled for choice, you are. Here's a list of the best things to do in Baños Ecuador. 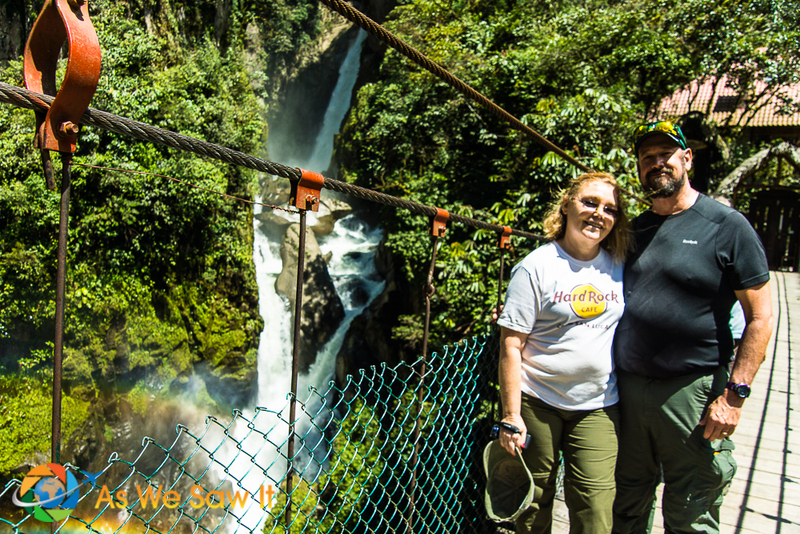 Baños, the “gateway to the Amazon,” was our final stop on a tour of Ecuador's Amazon basin in 2014. Our overnight stay made a nice contrast to the days we had spent “roughing it” in the jungle, a chance to relax for a night before heading home to Cuenca. 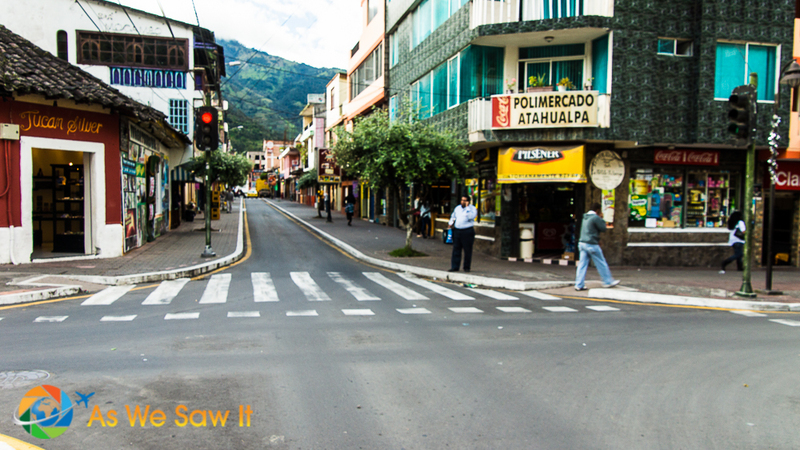 Banos is your typical Ecuadorian town which, if you're the curious sort, can be interesting in itself. When we travel, we think it’s fun to just soak up the local atmosphere and see how another culture lives – I'm talking about houses, shops, markets, clothing, what have you. 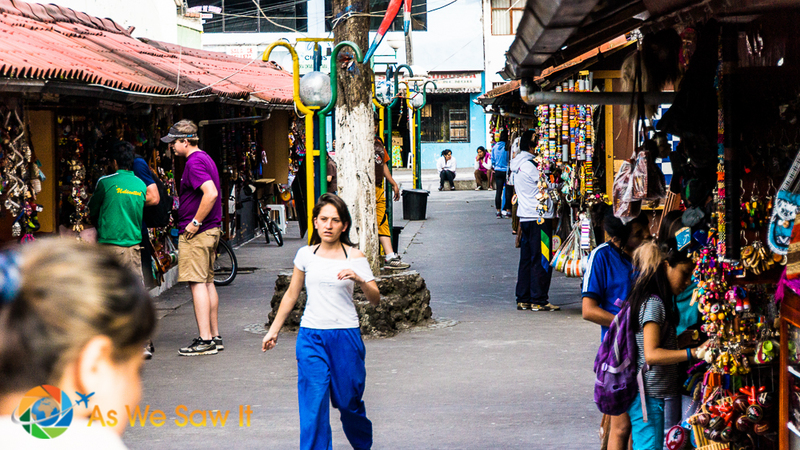 Walk through downtown Baños, explore the side streets, wander into shops … even if only for a short while, it's all part of the experience. You can even go a little further afield and explore the residential areas. 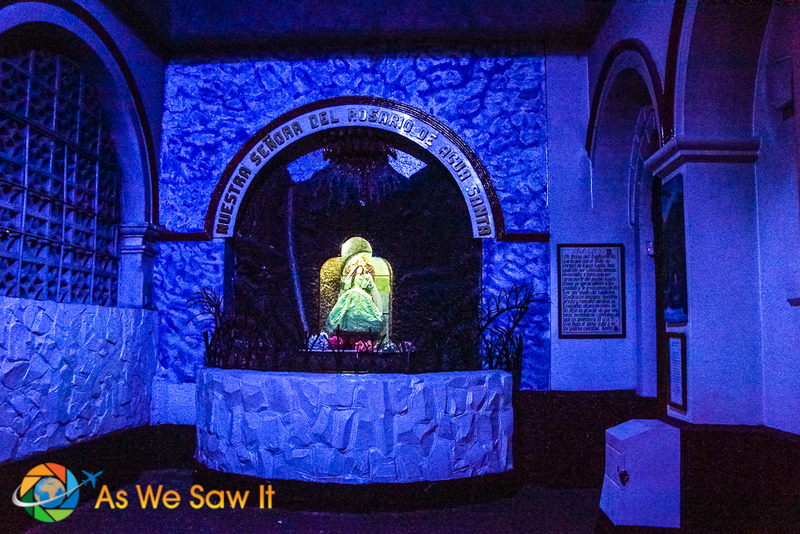 Baños can boast of over 60 waterfalls in the area but apparently, the Virgin Mary makes an occasional appearance at the waterfall in the center of town. This may appeal to you if you're Catholic. According to the locals, Santa Maria has performed a number of miracles in town, and so they named the waterfall in her honor, Cascada de La Virgen. As you'd expect, Baños is a pilgrimage site for the faithful of Ecuador. Even the town's official name, Baños de Agua Santa, means Baths of Sacred Water. Speaking of faith, Baños can also boast that it sits at the base of a live volcano. Tungurahua erupted only a few days after we were there, which really upset Dan. He wished he could have captured all the activity on camera. Non-photographers might imagine that living at the base of an active volcano would make its residents want to relocate. Not in this case … they believe that Baños is protected. Photo tip: At the other end of town is a short but steep hike to a statue of the Virgin Mary that offers fine views of both Baños and active Volcano Tungurahua. Baños dates back to 1570, a few years before the foundation of Quito, when Dominican missionaries traveled the region evangelizing. So, considering the importance the Virgin Mary has in the town's history and culture, it makes sense to begin with its religious focal point. Banos' first church was a humble hut. According to legend, someone saw an image of the Virgin Mary and two angels leave the hut and come to rest at a nearby waterfall. The following night, the Virgin appeared to the priest and told him to build a church. She also promised that the faithful who bathed in the waters would be cured of their diseases. 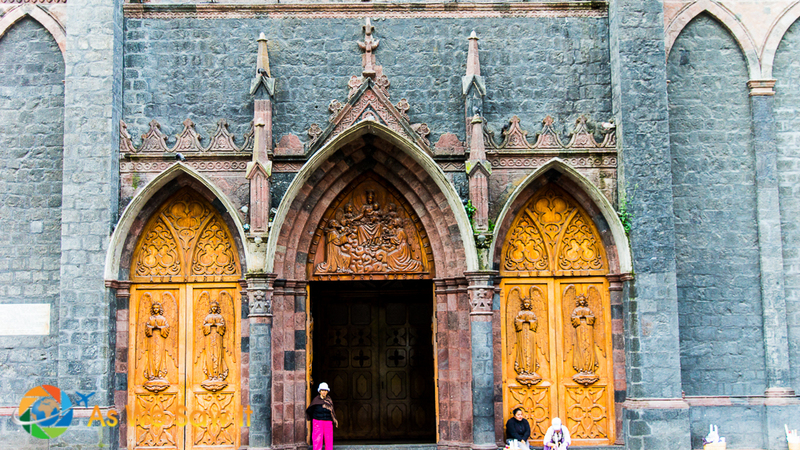 The town showed its gratitude for the promised miracles by building a neo-Gothic style basilica out of volcanic rock. They named it Our Lady of the Holy Water (Nuestra Señora del Agua Santa). Or Church of the Queen of the Holy Water Rosary (Basilica Reina del Rosario de Agua Santa). Every October, Banos holds a festival in honor of la Virgen de Agua Santa. It is visited by hundreds of domestic and foreign tourists who arrive in search of spiritual peace, some for the virgin or simply out of devotion. Regardless of its name, Banos' faithful citizens have always fled to the church whenever volcano Tungurahua erupts. Thus far they have always come out unscathed. Yet one more of the Virgin's miracles. 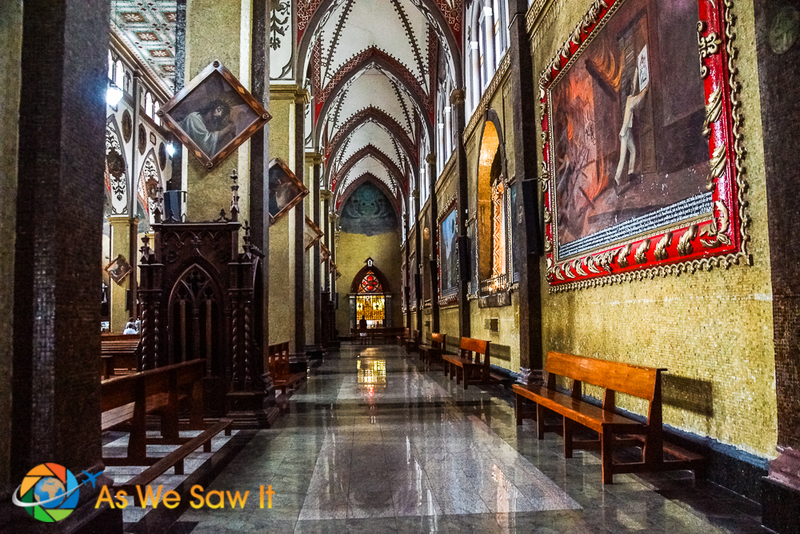 Instead of the usual Bible scenes that decorate the walls of most churches, the artwork on the walls of this sanctuary depict miracles that occurred in town, including saving the church from the volcano’s fury. Shrine to the Virgin. You can also visit a whole separate area with a shrine to the Virgin. While I’m sure it works for the locals, it definitely doesn’t work for me. With its pasty skin, the doll they used was pretty creepy-looking. Forgive me, but I don't consider it a compliment to the mother of our Messiah. It looked like a corpse overdue for burial. 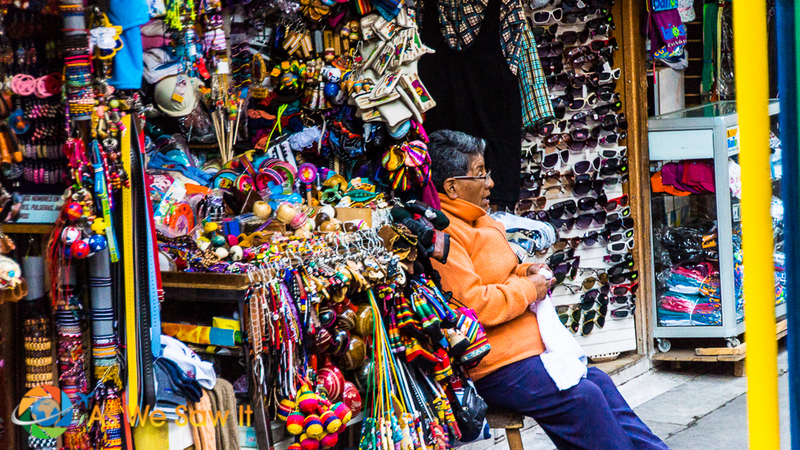 Not far from Banos cathedral is a pedestrian mall with stalls selling crafts, silver jewelry, and touristy knick-knacks. Many of them are crammed so full of stuff it is almost overwhelming. We saw one vendor sitting outside his shop, I guess because it didn't have enough room for him as well! As you can see, this woman knits hats for a living. (It can get cold in the mountains!) She was carrying on a conversation with her friend across the street, so focused that she didn't even notice Dan photographing her. This is one of the miracles that are portrayed in the basilica. You can see the remains of the bridge that fell, but far more impressive is the beautiful gorge itself. Banos is built along its edge, and the river is that same one that creates the stunning Pailon del Diablo waterfall nearby. Baños is the Ecuadorian mecca for outdoor enthusiasts. Walk through town and you’ll find plenty of agencies eager to take you on an amazing outdoor adventure. Any travel partners who don't want to get their hearts pumping can enjoy their slice of nature at the local zoo (Zoologico de San Martin). If you're an extreme sports lover though, you'll think you're in heaven. Just about anything you can do outdoors can be done in Banos. Whatever extreme adventure you can dream of, someone probably offers it. Tour companies are all over town. And that's just for starters. Take your pick, then go out and catching all that activity on camera. Your friends will be green with envy! You can’t walk through Baños without seeing someone standing in the doorway of his shop, pulling and wrapping a pliable length of color. They are making melcocha, a sweet taffy made from sugar cane. 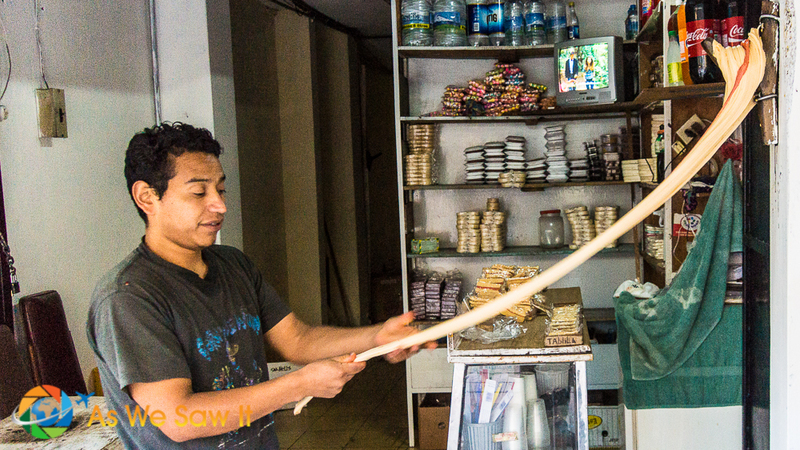 Each melcocha artisan has installed a wooden peg on the inside of his door frame. He will wrap the confection around the peg, then stretch and beat the taffy again and again, until it’s just the right texture. Once it’s done to perfection, they cut it in lengths and wrap it, ready for sale. If you’re lucky, you might be offered a sample, fresh off the peg. Be careful if you have dental work, though; it’s strong stuff. After all that activity, set aside some time to visit a spa. Whether you prefer high end spas or something moroe budget friendly, you'll find your fit in Banos. A local specialty worth considering is a $5 bano de cajon, or “box bath.” Literally named, you sit on a stool in a box, and are enclosed up to the neck so your body can be bathed in eucalyptus steam. You can control the steam via a lever inside and they will ask if you want breaks from the steam. That's when you immerse yourself in icy water. Massages, a spa classic worldwide, can be had for $25-$35 per hour. Other services, such as facials and manicures, are available as well. Unfortunately, since we were there for only one night, I couldn't carve enough time out of our visit for any firsthand research. What a disappointment that was. That Baños is a popular vacation spot for both Ecuadorians and foreign tourists was pretty obvious to us from the number of hotels and backpackers we saw. The big attraction is its aguas termales, or natural hot springs — and there are plenty of them in and around town, some complete with gyms and spas. All of the baths are fed by the hot springs coming from Tungurahua, the adjacent active volcano. The yellow water might make you pause, but relax. It's not dirty water you're looking at, but water that is rich with sulfides and natural minerals. The locals swear by its healing powers. After all the hiking we’d done we were ready for a hot soak, so after dinner we headed over to the public baths, called Las Piscinas de la Virgen. “They’re easy to find,” our guide said, “Just walk toward the waterfall.” Sure enough, we found the baths at its base. We paid our $3.50 admission, then I was directed to a shop selling snacks and trinkets to purchase the required bathing cap (40 cents!). After donning our bathing suites in the changing rooms, we showered and joined everyone else in the nearest pool. To say the pools are crowded is an understatement, but the atmosphere is friendly and pleasant. The hot water for the public baths comes from Tungurahua, the volcano next to Banos. The water is naturally full of healing sulfur. Few things can beat soaking in a natural hot springs, knowing you're getting good-for-you water, with a view of the sacred waterfall, La Cascada de la Virgen. Good memories. Anyway, different pools have different temperatures, depending on the amount of cold water mixed in. Some pools are so hot you'll need to take a break now and then just to bear the extreme temperature. There are even ice cold pools for people who enjoy shocking their bodies. We avoided both of those. Not crazy yet. By the way, we were among the last to leave and we saw the staff draining and scrubbing every pool. Tip: The pools are open during the day and again at night. They close in the afternoon to clean the facility. After dinner, we headed straight back to the hotel to get our bathing suits. This was our first opportunity ever to visit public baths and we weren't going to miss out! Roger and Jo also recommended some other baths that they like, right outside of Cuenca. It sounds like another field trip might be in order…. 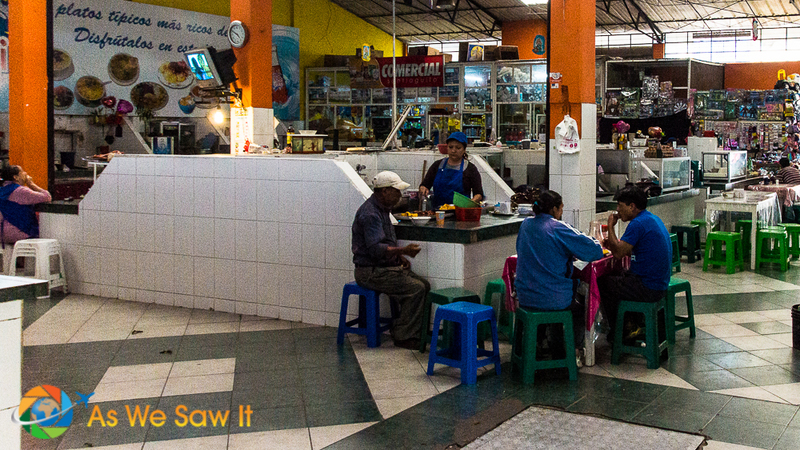 The mercado in the center of town is where to find local produce, meats, and more. If you’re adventurous and hungry, join in and sit at a stall where they will be happy to serve you a tasty and filling lunch of platos típicos, typical local fare for only a few dollars. Way to go … eat like the locals! 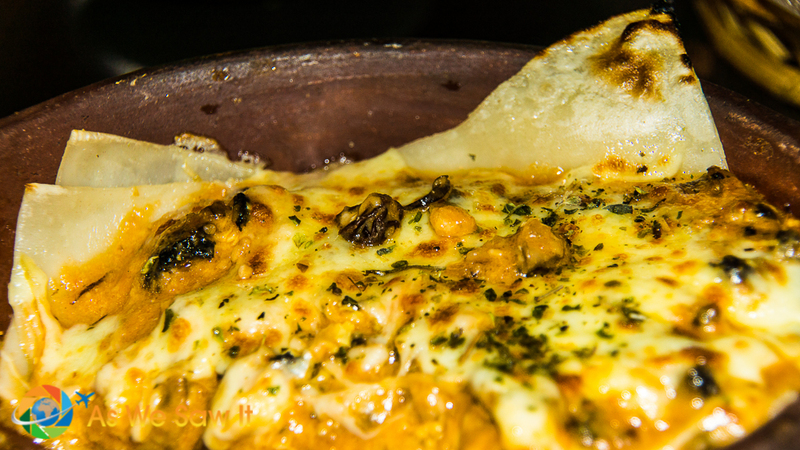 Baños has plenty of bars of course, as well as both international and local restaurants. We found a bar offering 2-for-1 happy hour mojitos (at Ecuador prices! ), then discovered a wonderful Italian place called Pappardelle Ristorante while searching for an early dinner. Dan's chicken lasagna was made to order. Can you tell? If this article was useful, you can thank us without paying a dime. Just use these links to make your plans, and some of these companies will pay us a referral fee, at no extra cost to you. Lodging– We stayed at Volcano Hotel, which is within walking distance of both the church and the baths. Check hotels on Booking.com. Fun: We recommend Get Your Guide, a reliable source for booking local tours, attractions and activities. Check their list of things to do in Banos here..
For more sightseeing, view our Banos, Ecuador photo gallery. Google Maps offers an aerial view of Banos. Zoom, scroll around and explore! My wife loved her trip to Banos Linda. What a fun time for her. Noted for when I finally visit Ecuador. She owes you a trip, Ryan. You’ll love it. I was there earlier this year and it seemed the most popular attractions were the Casa del Arbol and Pailon del Diablo. 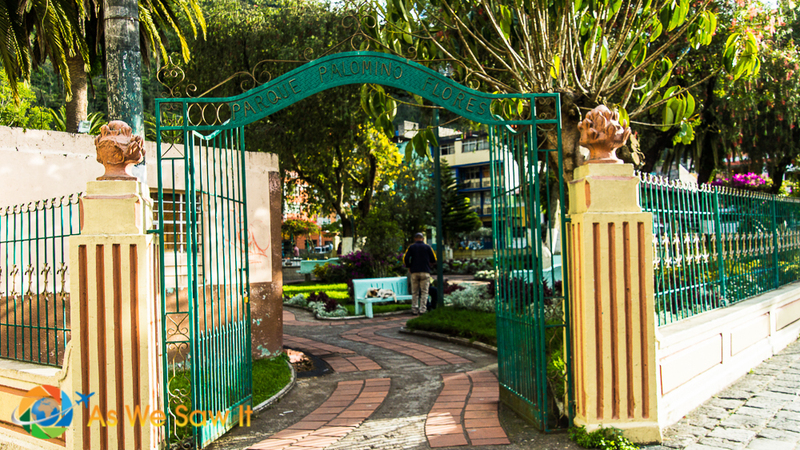 We didn’t bother with either (in fact our time in Baños was spent mostly resting and on the laptop), but it was great to learn about other things to do in Baños from your post! It wasn’t until later that I realized that Casa del Arbol was in Banos. So disappointed – I’d have loved to pose on that “swing on the edge of the world.” We did make it to Pailon del Diablo waterfall, though. That is one steep hike! Did you take a break from online and try the baths? Thank you; we enjoy sharing quality travel experiences. Must be interesting to visit the Rio Pastaza Gorge and see how that poor priest escaped death. Not that I doubt a miracles had happened, but there is always the possibility that the horse knew a way around it. Your pictures caught so well the local atmosphere! I should find a photo of that gorge for this article; it’s really deep, like a crevasse! The priest story intrigues me and I have never been able to come up with an explanation short of a miracle. I’d never considered that the horse might have known a way around it, Anda. Something new to think about. A varied colourful town, though I am not sure I would wan to climb the volcano – no matter what the local say. I doubt I’d do it either, Sally. Besides, I’m not much of a mountain climber. So do we, Elizabeth. I can’t imagine hitting the slopes at that age, but it would be nice if we were in good enough shape to have that option. Thanks for linking up. Oh my! There are so many things to do in this small town. I have read it is one of the best adventure towns in Ecuador. I like this kind of towns since there are plenty of activities to have during the day. Then, you can return to town and have great dining and drinking options. Ecuador seems so cool. I am not sure why I haven’t been yet. You should go, Ruth; it’s quite affordable. I’ll admit we were surprised at how varied the country really is. It’s a shame that most of Ecuador’s tourists visit the Galápagos Islands and nothing else. They are missing out. Nice list. 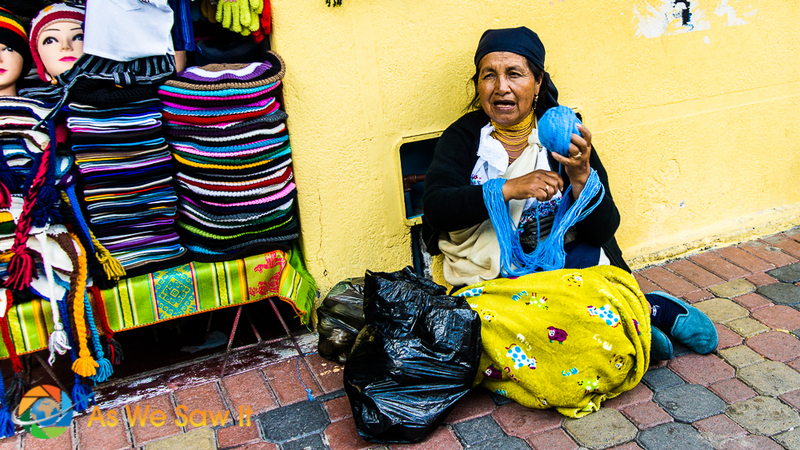 This reminds me of my trip to Peru – the colorful street vendors and beautiful cathedrals. 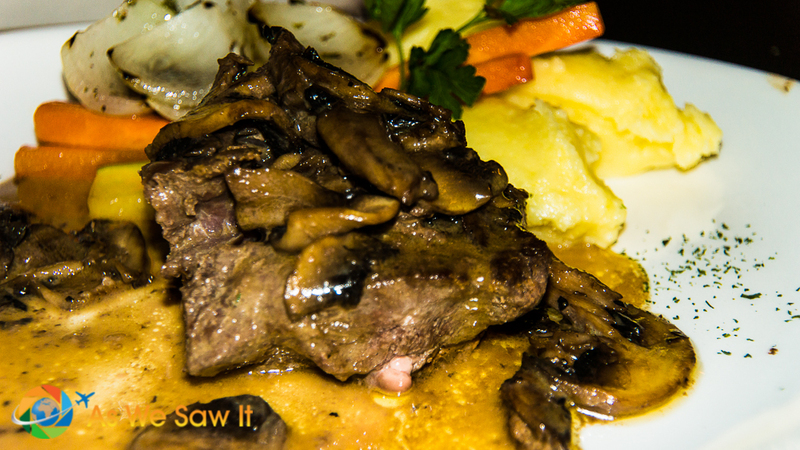 Lucky you, we were only in Lima for a stopover. What a small world; we actually visited that identical place, and I wrote about it too! I enjoyed reading your article because it gave me a different perspective on the sanctuary. Here’s our article: AmaZOOnico: Animal Rescue in Ecuador’s Amazon. Every photo in this post make me want to book a ticket right now. I would definitely like to explore the Amazon. Thanks, Jan. We tell everyone they should explore it. Best time of year is around June-July, when it’s cooler, drier and less humid. That weather makes for fewer mosquitoes as well. The Virgin Mary does get around, doesn’t she? 🙂 The miracle stories in Baños were fascinating. I wish the church had a website that listed them all. You know what, Agness, we don’t regret spending all our time exploring the town on foot at all (though I truly do regret not being able to get a massage). We were only in Baños for one night but we did manage to find a wonderful Italian restaurant on the main street called Pappardelle. If we ever return to Baños we plan to eat there again. It was that good. Thanks for this post! I’ve never heard of this place. Very colorful! I’m glad you enjoyed the story, Stephen. I enjoyed yours as well, though there was no way to comment on it. Please do stop by our site on Friday and share one of your delightful stories on our #TheWeeklyPostcard linkup. Great list! Banos is probably one of our favorite places to go to in Ecuador. There are so many things to do and see.